Imagine for a moment that you’re taking a stroll in the countryside and you happen upon an old well – what do you do? At the very least, you wander up and take a peek; you might drop a pebble down there, or even a cheeky loogie if nobody’s around. Why? 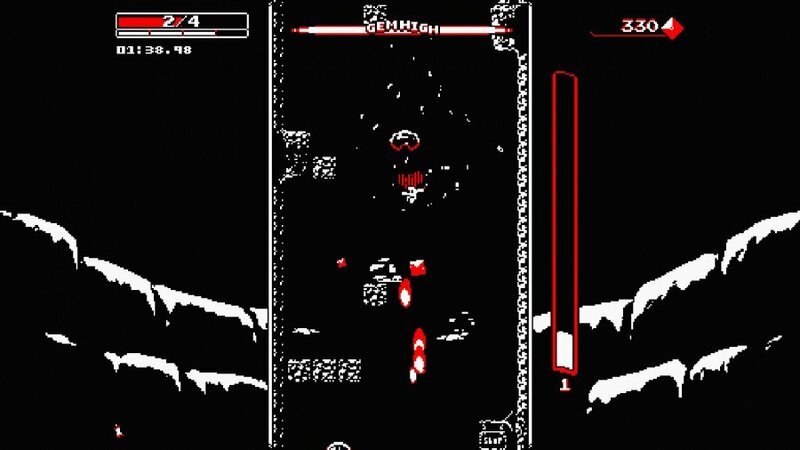 It’s tough to say exactly, but Downwell taps into that human fascination with the dark, unknown depths. First released back in 2015, we’ve waited months for this low-fi platformer/shooter hybrid to arrive on Switch. Creator Ojiro ‘Moppin’ Fumoto recently left Nintendo following a brief twelve-month tenure with the company and this version of his debut game feels like something of a parting gift; it’s arguably the finest way to play this acclaimed indie title. Coming courtesy of UK developer Red Phantom Games and US publisher Devolver Digital, Downwell is a roguelike. We use the term begrudgingly, knowing that it’s likely to turn off some people, but that’s what it is. Falling down a monochromatic well with style is the order of the day, and most of that style comes from the pair of 'gunboots' strapped to your feet to deal with enemies below. They’re fired by tapping the jump button in mid-air, which also enables you to ‘hover’ for a short while, but your ammo is limited and only recharges when you land on something solid. Expanding your clip size beyond the measly eight bullets you start with makes things easier – the game becomes more of a shooter the deeper you go. While you start with a basic shot, you can pick up other weapons such as a laser, shotgun and a triple-shot, some of which come with caveats, such as using up two pieces of ammo in a single shot rather than the usual one. Projectiles aren’t your only offensive option, though. Many enemies can be safely stomped on without firing and doing so not only reloads your clip, but also initiates a combo chain that’s broken only when you land again. Gems can be found and spent on health and ammo items in shops that pop up either side of the procedurally generated stages (there's another reason to collect these – bagging 100 gems in a short period triggers 'Gem High', which makes your weapon more powerful). Time ‘freezes’ around the entrance to shops and other caverns, enabling you to drop in and take a breather without breaking your combo. Free upgrades are available between stages (in standard mode) including health balloons which give you a free hit every stage, drones that duplicate your boots’ firing pattern and various other perks. 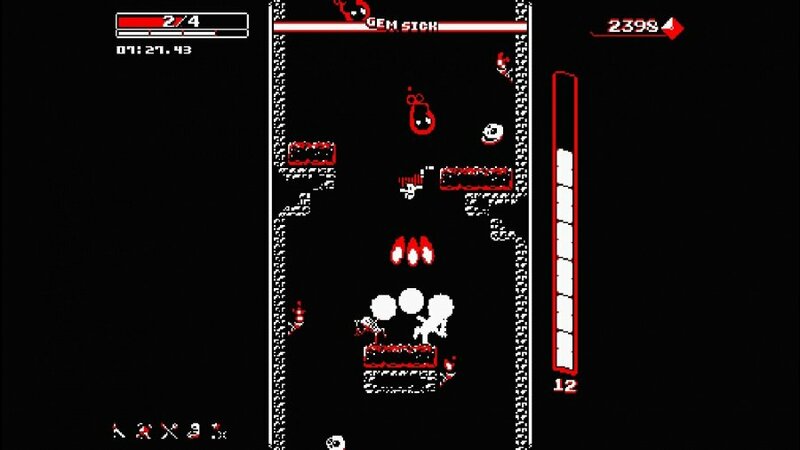 While your objective is very simple, Downwell is a punishing game in all the right ways. You’ll start off careening around the screen and you’ll likely have trouble parsing the elements as they zip past. Your brain is constantly playing catch-up, registering collisions just that split second too late, and it might turn off players who are used to 1-1 being a cake walk. Regardless of your skill, it’s extremely easy to lose concentration for a second and end up knocking a couple of bars off your health, even in the initial stages. Add in the fact that some enemies cannot be shot while others are impervious to head stomps, and things become complicated reasonably quickly. After a while, though, you acclimatise to the flow. Like riding a bike, the trick is to keep your eyes on what’s ahead and trust your mind to log that info and act on it without focusing on what’s directly in your face. It’s tempting to freefall as quickly as possible to the exit, but slow and steady invariably wins the race. If you find the standard gameplay too fast, unlockable alternative ‘styles’ make things a little easier: Levitate, for example, slows down your descent with floatier physics, while Boulder gives you more HP out of the gate. Some of these styles come with drawbacks, however, such as the removal of upgrades in-between levels or fewer shops appearing on the way down. The default white/black/red colour scheme looks fantastic but you’ll unlock a host of options that replicate iconic palettes from retro consoles – we were particularly partial to the Virtual Boy-inspired one. The animation looks great on Switch’s screen and performance is generally very smooth. Multiple enemy hits create a little slowdown but nothing that feels out of place; it’s tough to be sure it’s not there by design. The game weighs in at a mercifully tiny 58.7MB, too, so this might actually fit in your console’s internal storage. Despite its portrait orientation suggesting a mobile origin, this game cries out for a D-pad, and it did launch simultaneously on PC, arriving on Sony consoles shortly thereafter. 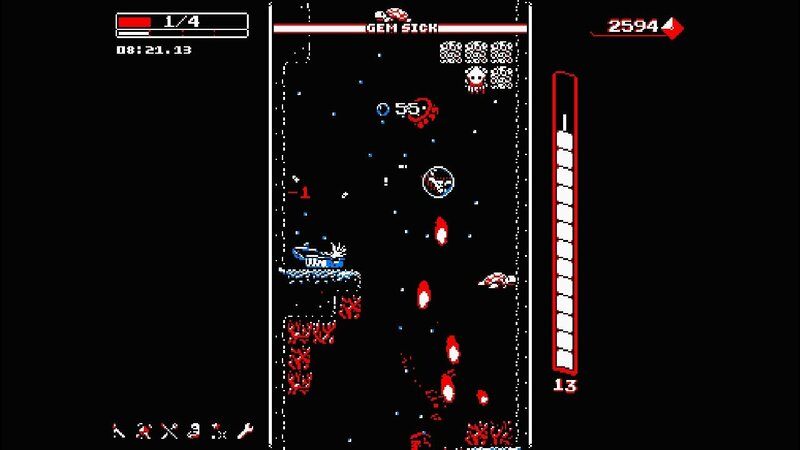 Of course, Switch owners have their own D-pad woes but Downwell controls very well on the Joy-Con, and a certain third-party peripheral helps this gem shine even brighter. The featured TATE mode flips the screen 90° and the increased size helps make everything more readable. In docked mode, you’ll have to lie on the sofa (unless you want to balance your telly on its side), but the very best way to play Downwell is with Fangamer’s superb Flip Grip, an inexpensive little peripheral that provides a portable vertical experience. It’s a bit of shame that Hori’s D-pad Joy-Con won’t work due to the pad’s lack of wireless connectivity, but we can hardly blame the game for that. Downwell shoots right to the top of the list of reasons to pick up a Flip Grip. For those with aversions to filling the house with yet more plastic doohickeys, you’re in luck – switching to TATE mode also changes the orientation of any attached Joy-Con, so you need only rotate the Switch in your hands to play vertically with no need for extra attachments. A tad top heavy and not ideal for long play sessions, it’s still an excellent little bonus and illustrative of the care and attention behind this port. You can even use the Joy-Con attached to the top of the console if the fancy takes you, or use your Switch Online-exclusive NES pads if you can’t survive without a D-pad. A single Joy-Con in either hand is another option; only touchscreen input is absent, but we’re happy to lose that. This is an excellent port of a game that feels like it’s found a natural home on Switch thanks to a plethora of control options and the console’s natural facility with vertical orientation. 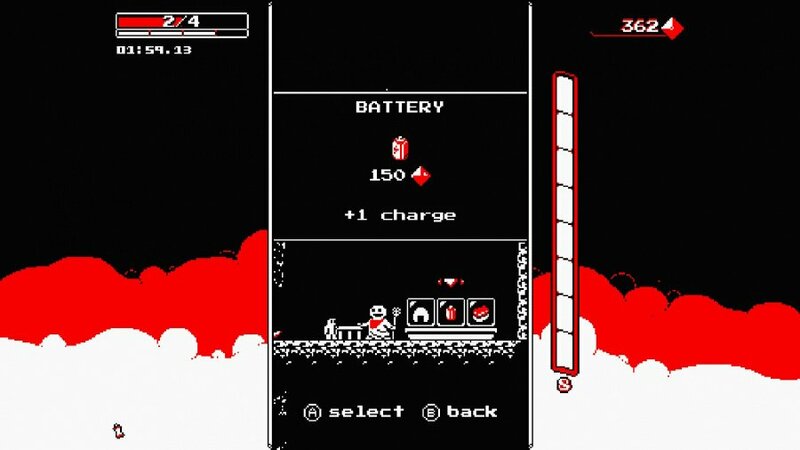 Short of popping your 4K TV on its side, Switch offers the very best way to play Downwell. Its roguelike structure and twitch platforming might not be for everyone, but you should really give it a chance. For our money, it’s a modern classic that should be in everyone’s collection. I've put an unholy amount of time into this on PC already, and I'd imagine that the Switch version provides an even better experience. To anyone who hasn't played this yet, do yourself a favor and jump in the well, though I can't guarantee you'll ever want to come out! This is one to look forward to for sure, I'm hoping to get it physical from Special Reserve Games, whenever that happens. For that price, might as well. Got this for free with my gold points. Sweet deal. By the way, I ask for a buddy of mine, what stands TATE for ? I've got it on my watch list but for the price, might as well just grab it now. Well at least it's cheap. I've played it for 10 minutes and already love it. Great game. I was sold as soon as I saw the trailer for it. Gonna play this a lot after work. I've been wanting to play this game with better controls than with my phone. Just didn't want to get it on PS4 because I also wanted it to be portable. Awesome Game for a good price + Flip Grip support. Can't say no to that! @Gradius @SenseiDje Yes, and a relic of arcade machines whose monitors would either have a vertical orientation (Donkey Kong, Pac-Man, Galaga) or horizontal orientation (Joust, Defender, Mario Bros.). Which made many arcade ports challenging for early home consoles, since our TVs always had horizontal orientation. @daggdroppen I've Spelunky on my Vita and PC and can't stop playing it. I've been playing it for years, beat it at every level more times than I can count, but I'm never quite able to move on from it – I think it's one of the greatest games in video game history. 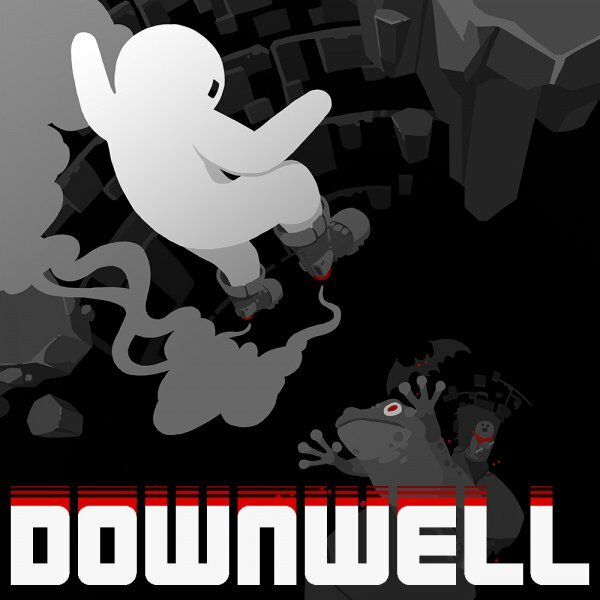 If Downwell is similar I'm in big trouble. If you have a rotatable PC-screen, with HDMI-in, that really goes Down Well with this game too. Since pinball fx3 do it nicely, I assume it’s possible ! Reminds me how some titles (mostly bullet hells) instead just rotated the whole game to go sideways on home consoles. They modified some sprites and backgrounds a bit, and then it all still worked out. This game along with Ikaruga are the reason I picked up a Flip Grip. Totally worth it. I have this on PS4, Vita, my phone...might as well buy it again. 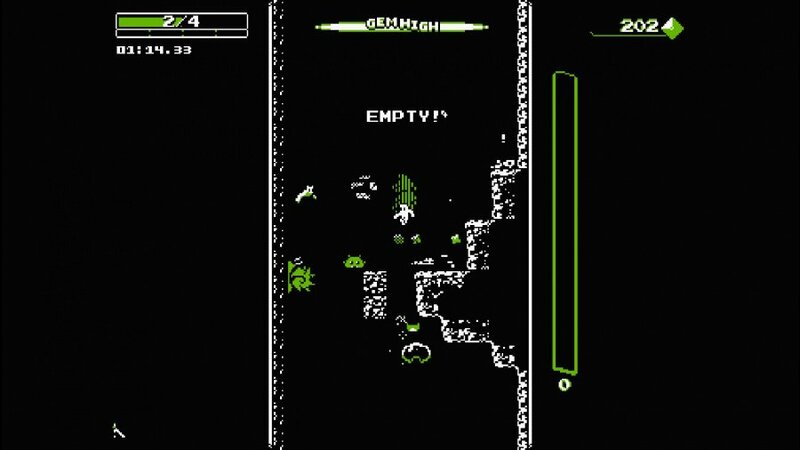 I’m terrible at it, but I love Downwell. I haven’t gotten passed the underwater stage, but maybe one day. @Tandy255 right I used to turn my CRT TV sideways to play shooters on Saturn. Very happy now to have lightweight rotating displays so I don't have to worry about crushing my fingers! This is that one game I thought would be a throw away when it was released, I waited until it was on sale on android and I found myself totally addicted to it (kicking myself for not playing it sooner). I'm totally buying this again for the Switch, it is a must buy and only $3! Can’t wait to try this. I was hoping they’d port it to Switch because I didn’t wanna buy it on my phone; looks like a ton of fun! Well, I'm down with that. I have it on Android and Windows 10 already, and love it! I also love the music, having featured a track from it in my indie games focus episode: episode 30 (C1E30: The Big Sound of the Little Guy) from June 2018.....shameless plug (YouTube, iTunes, Blogspot, etc). However, you're right, the Switch seems like the perfect platform for the game, so I may well spring for it here. @SenseiDje its the Japanese term for ‘vertical’. This game feels phenomenal. This plus Ikaruga has sold me 0n a Flip Grip. I h0nestly feel guilty getting this game for only $3. @SenseiDje And it is pronounced "tah" (as in TALL) - "teh" (as in TELL). Definitely picking this up. Bargain! Downwell is more light than Spelunky. But Downwell is also a game to return to after many years! @daggdroppen Great! It sounds even more appealing. Spelunky is still a challenge now – so something a bit lighter sounds great.